Which side are you on? Jacobin and the revolution in the Philippines | Fight Back! Chicago, IL - A piece was published at Jacobin recently by Alex de Jong. He’s a representative of a Trotskyite Fourth International journal in the Netherlands. Normally, I wouldn’t waste time responding to anything written by anyone affiliated with the Fourth International, but Jacobin has a wide readership among young leftists today. Therefore, this is first an objection to Jacobin running such trash. De Jong attacks an interview with Jose Maria Sison that Jacobin published last month. Joma, as he is affectionately known, was founding chair of the Communist Party of the Philippines (CPP), and perhaps the most influential living Marxist-Leninist. The interview with Sison includes discussions of the peace talks between the government of the Republic of the Philippines and the National Democratic Front of the Philippines (NDFP), the revolutionary united front that includes the New People’s Army (NPA). 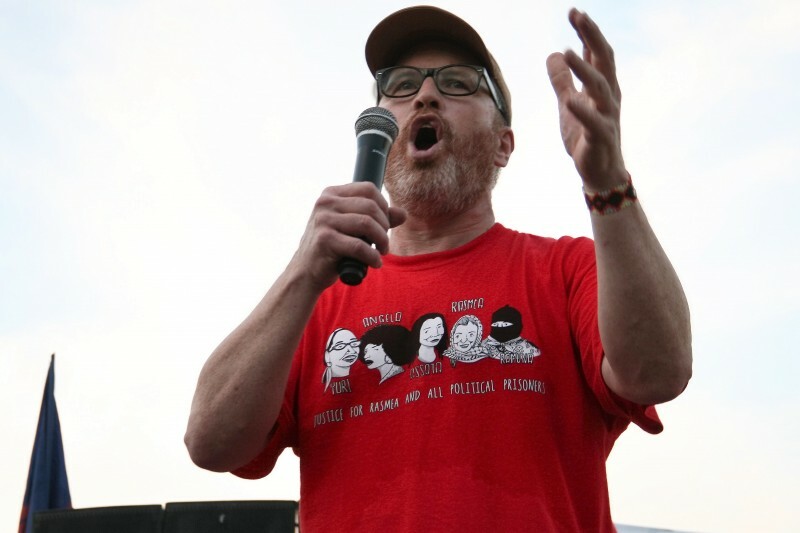 De Jong’s starting point in attacking the interview is an alleged assassination campaign against other leftists resulting from the NPA’s plan to “impose a monopoly of power above the people’s movement” as he put it. This slander is based on 15-year-old claims by Walden Bello, a former revolutionary and now on the payroll of international agencies. At the time, the CPP issued a statement denying any such campaign. That interview, entitled “The Fate of the People’s War,” touches on some of the strategy that the NDFP has for negotiations with the government. Among others, the Comprehensive Agreement on Social and Economic Reforms (CASER) is a brilliant idea. It proposes that peace talks should address the underlying basis for the armed conflict, namely, the extreme poverty and oppression of 107 million Filipinos. The national democratic revolutionary forces of course are organizing and fighting for land reform. Even in negotiating, the NDFP wants to address the exploitation of the Philippines by U.S. imperialism; the continued reactionary politics in the country resulting from the fact that a tiny number of families still control the majority of the best farm lands; and as a result, most of the population, which is either peasants, or former peasants now scratching out an existence among the urban poor, are in crisis precisely because they are landless. There is a misconception among people in the anti-war movement in the imperialist countries that peace negotiations are just about giving up armed struggle. In reality, successful forces fighting for national liberation follow the approach used by the Democratic Republic of Vietnam in the U.S. war of aggression there: negotiations on the basis of strength. Or talking while also fighting. Revolutionaries in the Philippines have this same approach. They refuse to lay down their weapons in a situation of civil war that has gone on for 50 years and cost over 40,000 lives, mainly those of revolutionaries and their supporters. Some people miss a forest because of the trees. De Jong misses even the trees. He believes there is some revolutionary struggle going on in the Philippines separate from the national democratic revolution. Only someone who fails to see that there is an actual revolution, and an actual armed challenge to the reactionary rule of imperialism, feudalism, and bureaucratic capitalism in the Philippines, could believe that the CPP-NDFP-NPA don’t have the trust of the struggling people struggling. I worked with the Philippines solidarity network in Chicago from 1986 until 1994, and was a witness as the Filipino leadership in Chicago abandoned their revolutionary goals in favor of social democracy. What I saw was that the crisis of confidence for them came because they had erroneously believed that their role in the resistance to martial law under Ferdinand Marcos throughout the 1970s, until his overthrow in 1986, meant they were predestined to lead the overthrow of the dictator. Instead of this happening, a split took place among the comprador and big landlord Filipino ruling class, which resulted in the Armed Forces of the Philippines turning against Marcos. The other traditional ruling families, headed by the Aquinos, with the support of the U.S., and the reactionary Catholic hierarchy, led a mass uprising to end the rule of the Marcos’ regime. The revolutionary movement had plowed the land for the rebellion, and many thousands lost their lives in resistance. But they hadn’t consolidated the revolutionary alliance of peasants and workers under the leadership of the party for a successful socialist-oriented national liberation struggle. When Marcos was overthrown, some of the CPP national leadership turned ultraleft, believing that the time had come to abandon people’s war in favor of battalion-sized military confrontations. Others, such as those in Chicago, became rightists. Instead of military adventurism or social democracy, Sison and his closest comrades called for a rectification campaign within the CPP to correct left and right deviations. In several important theoretical works, he showed the need to stay on the path of national democratic revolutionary struggle, in which people’s war in the countryside would be the main tactic. It was to be combined with the legal forms of struggle, even participation in reactionary institutions, including the government. Bello made an electoral alliance in 2016 with the liberals in power, but it failed to gain any influence in the government, and now, with Duterte’s embrace of Donald Trump, and of the counterinsurgency strategy of the United States, Bello is proposing that the movement unite with him - under his leadership, of course - to shape a new political order. No doubt, his intention is to return to the elite politics of neoliberalism, but with a social democratic veneer. This may be why his Trotskyite supporters chose this timing to renew the slander against Sison and the national democratic movement. Chauvinism or anti-chauvinism: What kind of a socialist movement will we have? De Jong uses language to discuss the national democratic movement in the Philippines that is so dismissive as to be contemptuous. The scale and intensity of struggle of the Filipino people is something that few movement activists in the advanced capitalist countries could even imagine. Around the world, serious revolutionaries see the movement that Sison helped to launch as one to be studied. This phenomenon of arrogant contempt for the politics of national liberation in the semi-colonial, semi-feudal countries that make up the majority of the population of the toiling masses on earth is over a century old. The Bolshevik Party of Russia led a break with the so-called socialists of the Second International, who thought the struggles of the colonial people didn’t rise to the level of socialist politics. Sadly, many of those who call themselves ‘socialist’ in the rich countries today suffer from this poison. De Jong over and again displays an incredible ignorance of the history and the terms of the Filipino struggle. Take for example, his remarks about the “other left” in the Philippines. Yes, there’s a layer of college professors and internationally funded offices in the major cities that advocate for reform. But there are tens of thousands of activists and revolutionaries nationally, with revolutionary fronts in 73 out of 81 provinces, rooted in the lives of the urban poor, the Lumad people of Mindanao and other indigenous groups, the peasant associations, the faith based organizations, students, youth, artists, and of course the unions. The vast majority of the organized people are with the national democratic movement. The claim of an optional movement to support in the Philippines, made by some U.S. and European leftists, reminds me of the nonsense since 2011 about a ‘revolution’ in the areas of Syria dominated by the right-wing rebels (Free Syrian Army, Al Nusra Front, and the Islamic State), funded and backed by the United States, Israel and the reactionary Gulf States. People in the United States and other advanced capitalist countries who are being drawn toward socialist politics today need to grapple with what the majority of the revolutionary movement in the world understands: that the main contradiction in the world today is between imperialism and the oppressed nations and peoples of the world. A successful strategy for revolution has unite against monopoly capitalism, or imperialism at its core. Internationally, how can there be a successful strategy that doesn’t rely on the majority of the people oppressed by imperialism? The answer is simple, there can not. Joe Iosbaker has done solidarity work for the struggle in the Philippines since meeting the League of Filipino Students in 1986. In recent years, he participated in the International People’s Tribunal in Washington, D.C., in July 2015. He traveled to the Philippines in July 2016, representing the United National Antiwar Coalition at a conference of the International Coalition for Human Rights in the Philippines. Iosbaker is also a founding member of Freedom Road Socialist Organization.